These browsers do not operate normally with the following settings. Change these settings when applicable. * If the Referer setting in your browser is Disable, the browser does not operate normally. After enabling Referer, access OPAC again. * It is possible for the content to be displayed as follows when the compatibility view is turned on with Internet Explorer8. The column width of specific items in the bibliography details holdings list narrows drastically. A gray line borders each bibliography in the search result list. 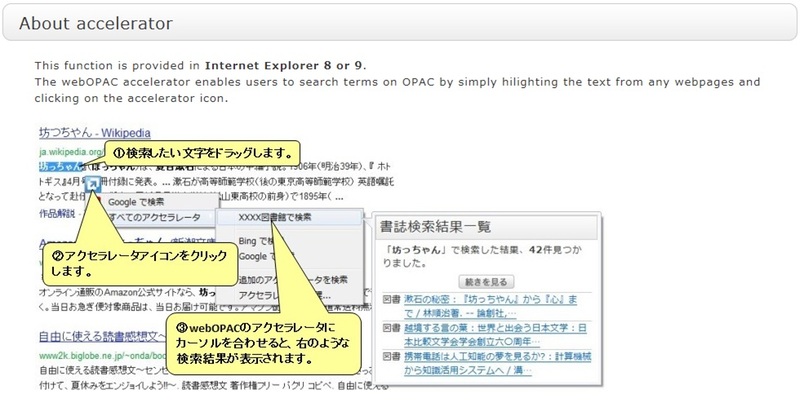 ★What can I find with OPAC? 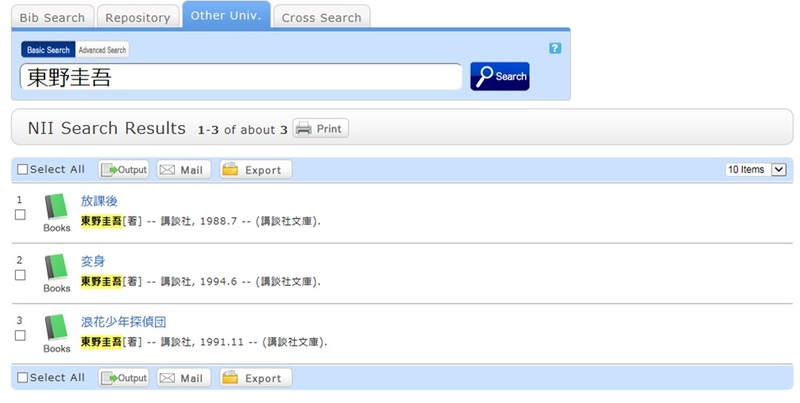 Cross Search: Materials in the possession of national universities, the National Diet Library, bookstores, etc. Switch to and use the tab appropriate to the search target and materials. For details, see the respective tab. ★I would like an explanation of matters such as how to use each database, how to find materials, and how to use the library effectively. An answer is currently being prepared. I'm looking for a material titled _____. How should I begin? [Bib Search] allows you to perform a search. Perform your search from the [Bib Search] tab. 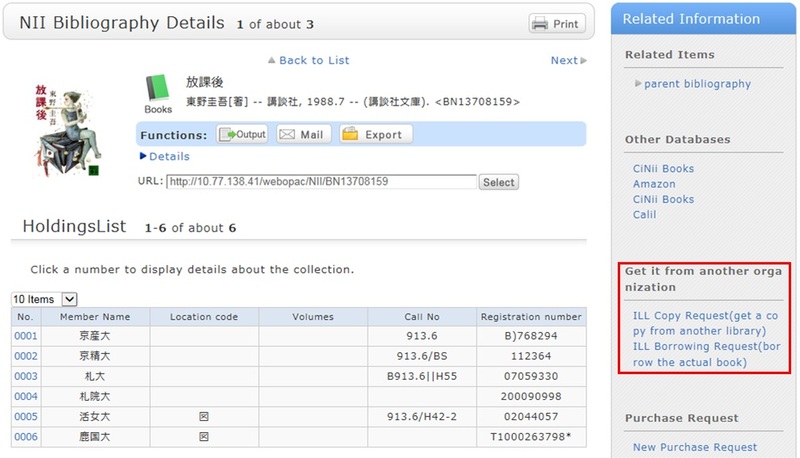 If you do not find the material with [Bib Search], you may get it from another university library for a fee. You can search other universities from the [Other Univ.] tab and the [Cross Search] tab. 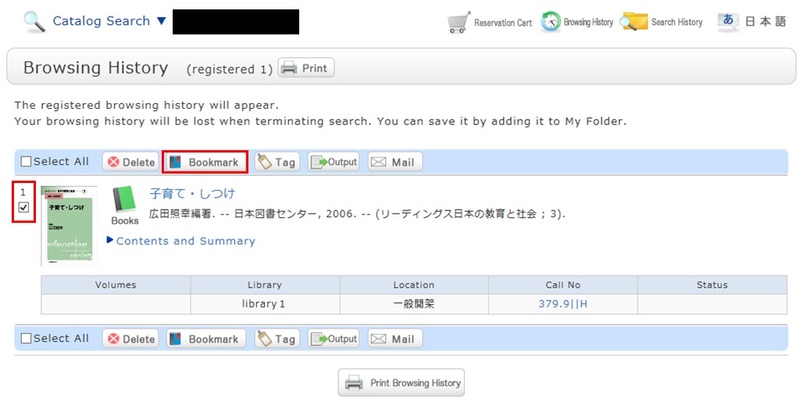 The Cross Search can search the National Diet Library and local library book collections. The National Diet Library is struggling to store all the books published in Japan. Serials are basically the same as books. However, our serials consist of the printed versions held in the library and the electronic journals provided through agreement with the publishers and others. You can check the electronic journals from your personal computer. 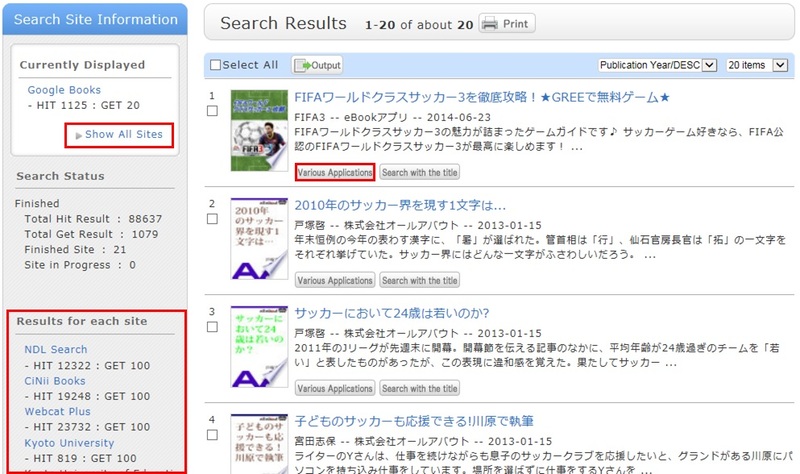 [Article Search] makes it convenient to search for an electronic journal. Perform a search from the [Article Search] tab. From Basic Search on [Article Search], you can perform a search without specifying a specific search site. To perform a search specifying a specific search site, do so from Advanced Search. The pop-up blocker appears when I reserve or copy materials or apply for an inter-library loan. 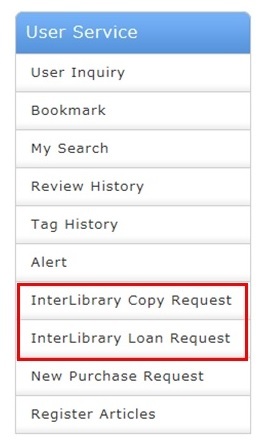 Depending on the settings of your browser, an action such as reserving or copying materials or applying for an inter-library loan (ILL) will trigger the pop-up blocker, which will prevent you from proceeding any further. * The screenshot is from Internet Explorer 9. The pop-up blocker appears in different locations depending on your browser and version. For details, see the help of the respective browser. Click [Allow once] on the pop-up blocker notification bar. 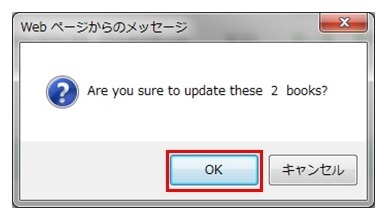 * However, with this method, if the browser is closed once, the pop-up blocker is enabled when the browser is started again. Consequently, the same work will need to be repeated to apply for a reservation or ILL in OPAC. Click "Always allow" from [Options for this site] on the pop-up blocker notification bar. * Even with the pop-up blocker enabled, some notification bars may not appear. In such cases, select [Tools] -> [Pop-up Blocker] -> [Pop-up Blocker Settings] from the browser menu. 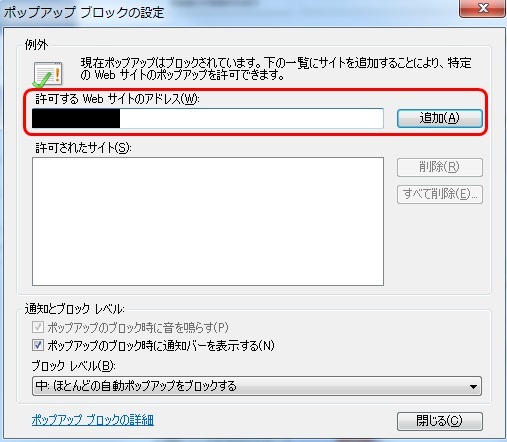 Then, enter the website address to be unblocked in "Address of website to allow," and click [Add]. Click [Close] to exit the screen. * Safari users are requested to go to Security in the browser settings menu to confirm that no check mark is entered in the "Block Pop-up Windows" check box. * If you are a Google Chrome user, click here. After enabling pop-ups as described above, repeat the procedure for your application from the beginning. What should I do if I know only part of the title of the material? Once you enter part of a keyword on the [Bib Search] tab, the suggestion function displays materials whose titles begin with your entered character string in a list of potential matches. Select one from the displayed potential matches and press the [Search] button to start the search. How do I search with an ISBN or ISSN (number)? 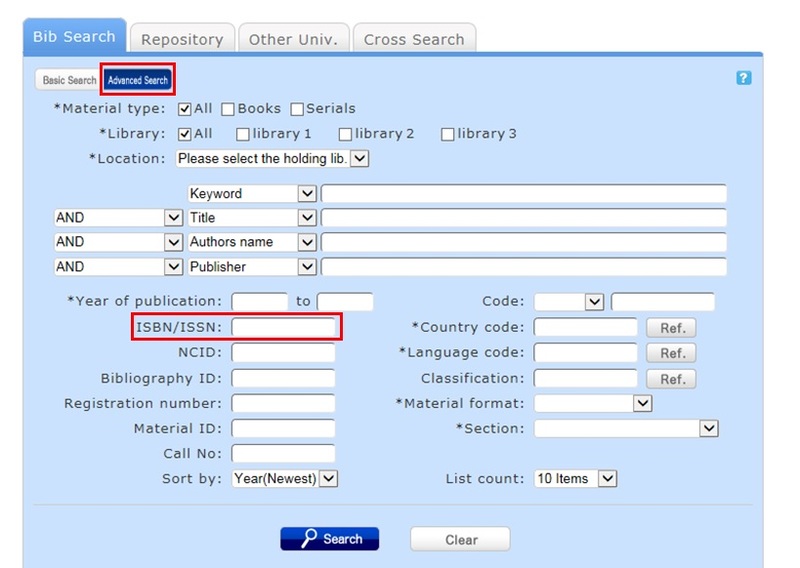 You can perform a search simply by entering the ISBN or ISSN (number) on the search bar of the [Bib Search] tab. You can also perform a search from the advanced search screen by clicking the [Advanced Search] button on the [Bib Search] tab. 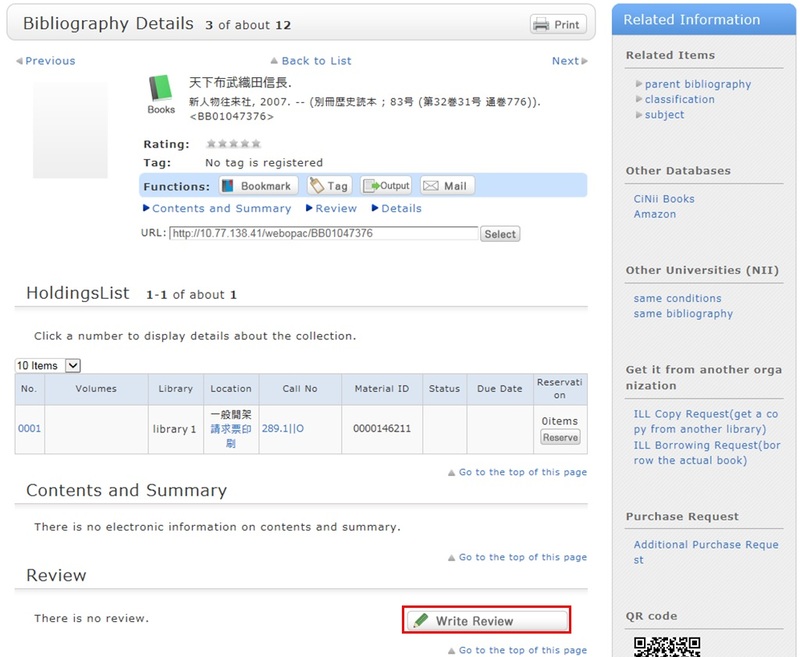 You can perform the search by filling in the ISBN/ISSN field. ISBN (International Standard Book Number): This number identifies a book. ISSN (International Standard Serial Number): This number identifies a serial. What characters can I use with the [Bib Search] tab? On the Japanese-language pages, you can use Kanji, Hiragana, Katakana, and alphanumeric characters. For alphanumeric characters, you can enter uppercase and lowercase characters. Single-byte and double-byte characters can both be entered. Searches can use the original spelling (with characters as they appear in materials). Searches can also use keywords converted into Roman alphabet letters using the ALA-LC Romanization Tables of the U.S. Library of Congress. Some materials are registered in Roman alphabet letters only. An index is created for them. So if the search has no hits with the original spelling, convert the keywords into Roman alphabet letters, and perform the search again. How do I search for materials when I don't remember the title? Think about keywords about the materials. Then, try a search by switching to Advanced Search on the [Bib Search] tab and entering the keywords. If the search has an excessive number of hits, you can narrow it down with the [Classification] item from the [Refine Your Search] menu displayed on the left side of the search result list screen. In addition to using the classification item, you can also narrow down your search by material type, holding library, author, publication year, classification, subject, publisher, language, etc. If the keyword search is unsuccessful, try using Search by Classification in the lower part of the [Bib Search] tab. "4: Natural science -> 41: Mathematics -> 417: Probabilities. Mathematical statistics." What should I do if I want to use a combination of multiple search conditions (such as one including x or y)? You can perform the following three searches by entering multiple conditions in a single search field or filling in multiple search fields (logical operation). Entry method: Connect all search values with " " (blank). Example: Search for materials containing both "Japan" and "America"
Entry method: Connect all search values with "+" (plus sign). 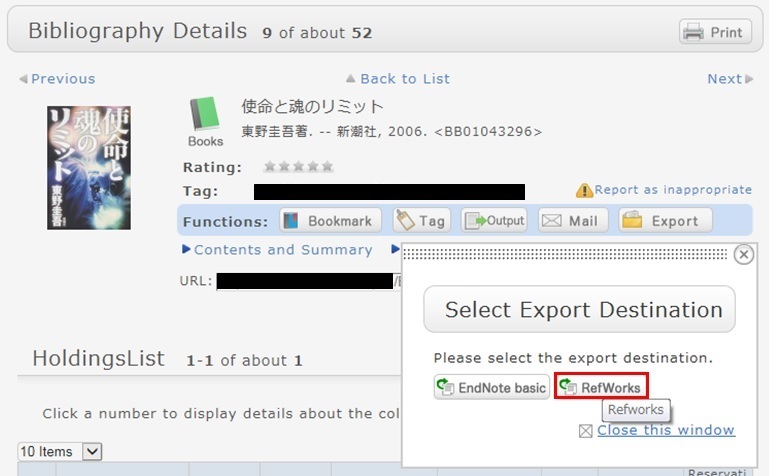 Example: Search for materials containing either "Japan" or "America"
Entry method: Connect all search values with "^" (caret). 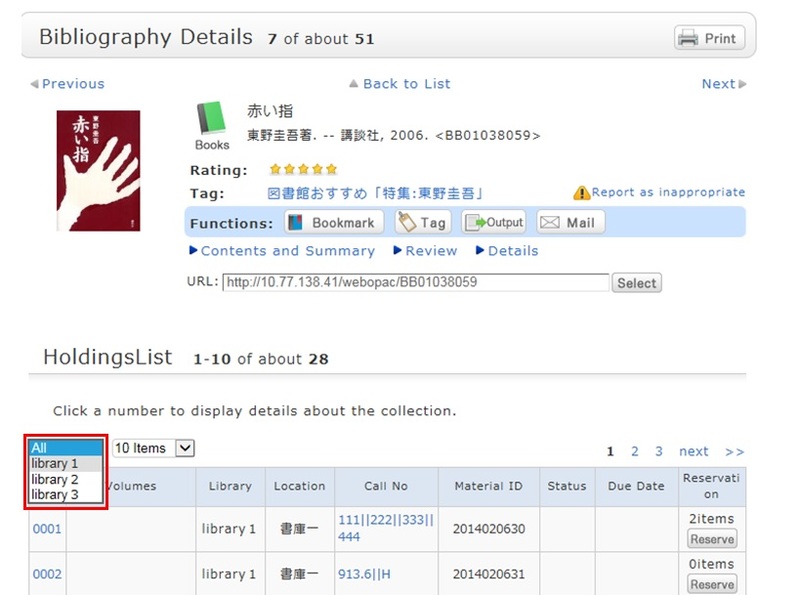 Example: Search for materials containing "Japan" but not "America"
Entry method: Enter search values in multiple fields, and select "AND" from the pull-down menu between the fields. Entry method: Enter search values in multiple fields, and select "NOT" from the pull-down menu between the fields. The following search items are called primary search items. You can perform searches independently with their search values alone. The following search items are called secondary search items. You cannot perform a search with a secondary search item unless it is combined with at least one primary search item. The search screen displays * in front of the item names. When I search for materials whose title starts with _____, or ends with _____. There are two search methods: keyword search and literal search. The keyword search is a search of materials to find those containing the entered search value as a word (i.e., keyword). The literal search is a search of materials to find those containing the entered search value as a simple character string (i.e., literal). For the literal search, you can specify the following search methods. Searches for the following search items are normal keyword searches. To perform a literal search with the following keyword search items, add "#" to the beginning of the search values. Searches for the following search items are normal literal searches. By using the literal search, you can set the following search conditions for the details. What kind of items can I use in searches from [Bib Search] on the advanced search screen? You can perform searches with the following items on the advanced search screen. The △ symbol in the entry example represents one or more blank characters. [Local] means that the search item is enabled only for local searches. Values entered for NII searches are ignored. Material type Narrows down the type of material that is the search target. 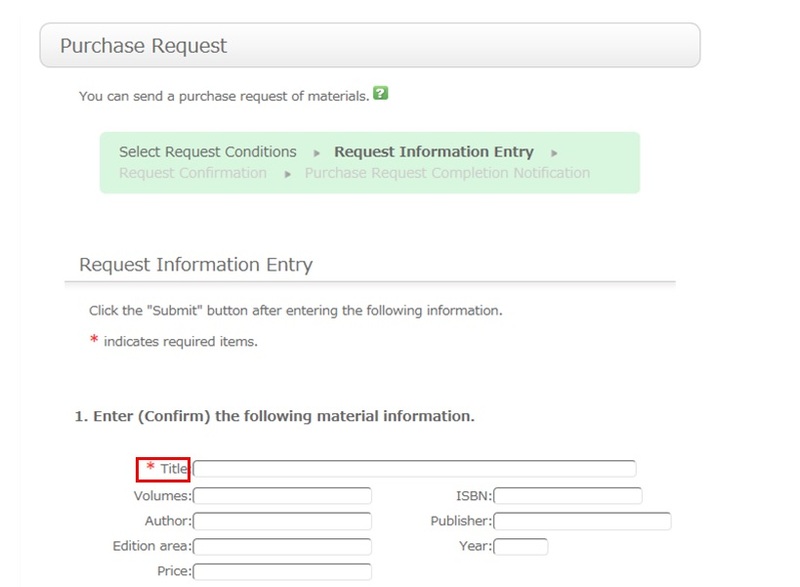 Check the check box of the material type, such as All, Books, or Serials. [Local] Narrows down the campus or holding library that is the search target. Check the check box of the campus or holding library. Materials whose title, author's name, and subject contain "Japan," "Tanaka," and "politics"
Materials whose title, author's name, and subject contain "Japan" or "politics"
Materials whose title, author's name, and subject contain "Japan" but not "politics"
Materials whose title contains "Japan," politics," and "of"
Materials whose title contains "Japan" and "politics"
Materials whose title is "politics of Japan"
Works by authors whose name contains "Fuji" and "Hanako"
Works by authors whose family name or given name contains "Fuji"
Works of authors whose family name begins with "Fuji"
Materials published by "Fujitsu Press"
Materials published by a publisher whose name contains "Fuji" and "Publishing"
Materials whose subject is "library information"
Materials whose subject contains "toshokan" and "joho"
Material whose NII bibliography record ID is N10202348. Can I use only Roman characters to search Japanese language materials? By placing a "$" symbol in front of Roman characters used for search values, you can convert the Roman characters into Katakana characters to perform a search. Writing in the official Kana romanization system and the Hepburn system is supported. The Roman alphabet doesn't correspond to the long vowel character. For example, please enter "$kiwado" not "$kiwado" when you want to get the same result in the "キーワード." ★What if I want to find out whether a neighborhood library, bookstore, or somewhere else has a book not available at the university? To search a library, bookstore, or elsewhere, enter a check mark beside it on the [Cross Search] tab, and perform the search. University libraries: Neighborhood university libraries, etc. Public libraries: Book collections of neighborhood public libraries, etc. The search result list screen can display the search results of each specific search site or all sites. The first displayed search results belong to the search site where the search ended the earliest. If you want to find out the search results of another site, select it from the left menu. You can display a list of search results of each specific search site by clicking "Show All Sites" at the top left of the screen or clicking the site link in the results for each site on the left side of the screen. The number of acquired results is limited (10 to 100) depending on the site. If you want to find out all the search results of a specific site, perform the search directly from that site. The results of searches with [Cross Search] may differ from the direct search results of a specific search site. Use [Cross Search] mainly as a guide to determining the good sites to search for the materials you are looking for. 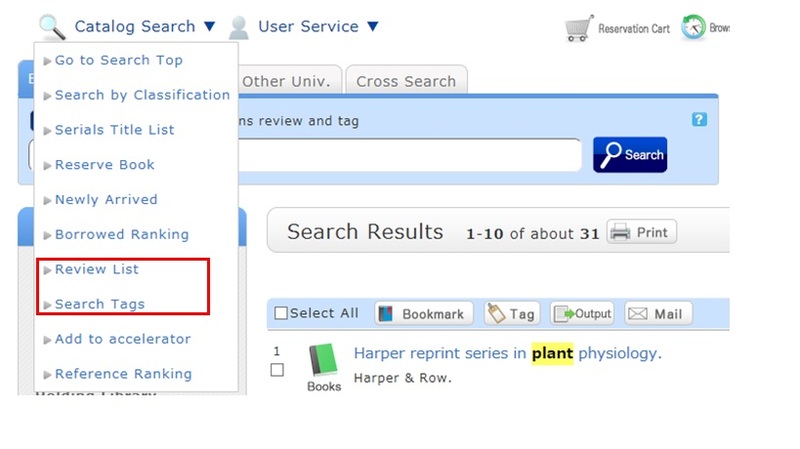 By selecting "Various applications" displayed for the bibliography on the search result list screen, you can make an ILL copy request (getting a copy from another library) and an ILL borrowing request (getting a book from another library). I found a book with OPAC, but I don't know its location on the bookshelves. The search results include a call number in the holding library information. An image of the call number label appears when the cursor is placed over this link. This image corresponds to the label on the book. The library bookshelves are arranged in order of call number. From the signs on premises and this number, find the bookshelf. What should I do if the materials found with OPAC are already loaned out? When Bib Search finds "Loaned out" materials, you can reserve the materials as follows. 1. 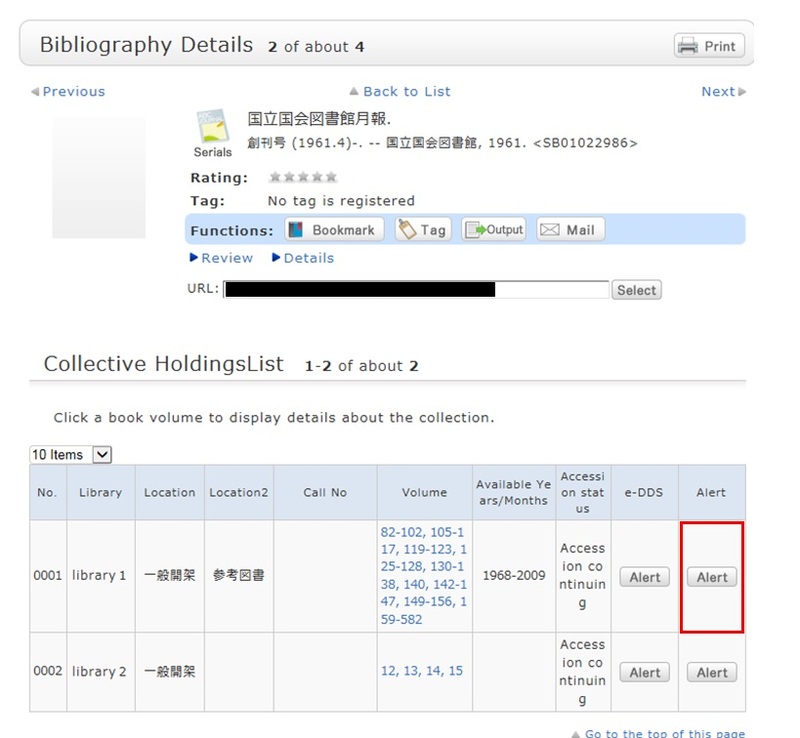 Click the [Reserve] button in "Holdings List" on the bibliography details screen. 2. Select the request conditions, and click [Select] on the Select Request Conditions screen. 3. Confirm the material information and reservation client information on the request information entry screen. 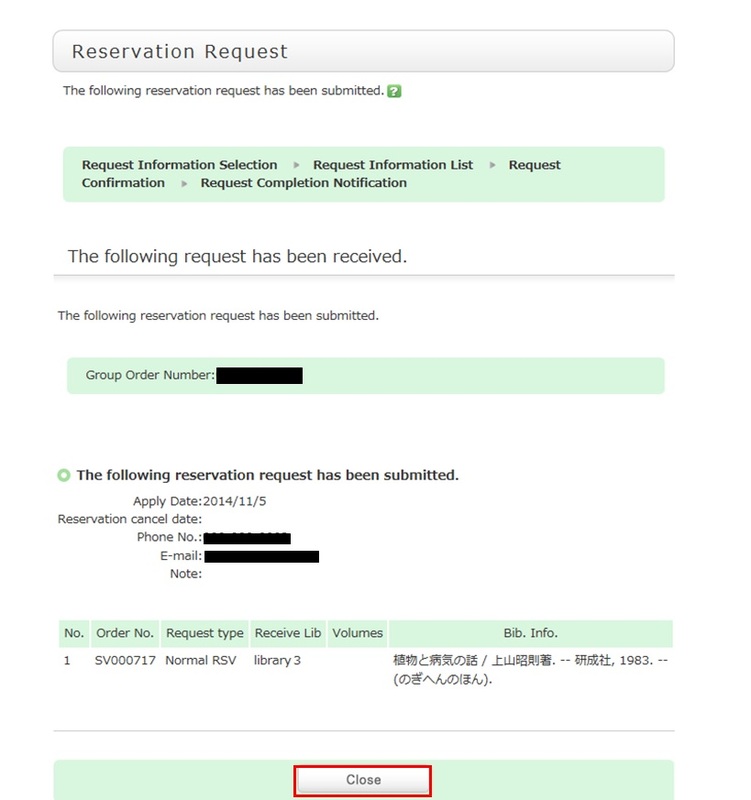 Then, enter (confirm) reservation details. Lastly, click the [Submit] button. Reservation cancel date: The reservation is canceled when the entered date has passed. E-mail: From your registered e-mail addresses (PC/mobile phone), select a contact e-mail address. 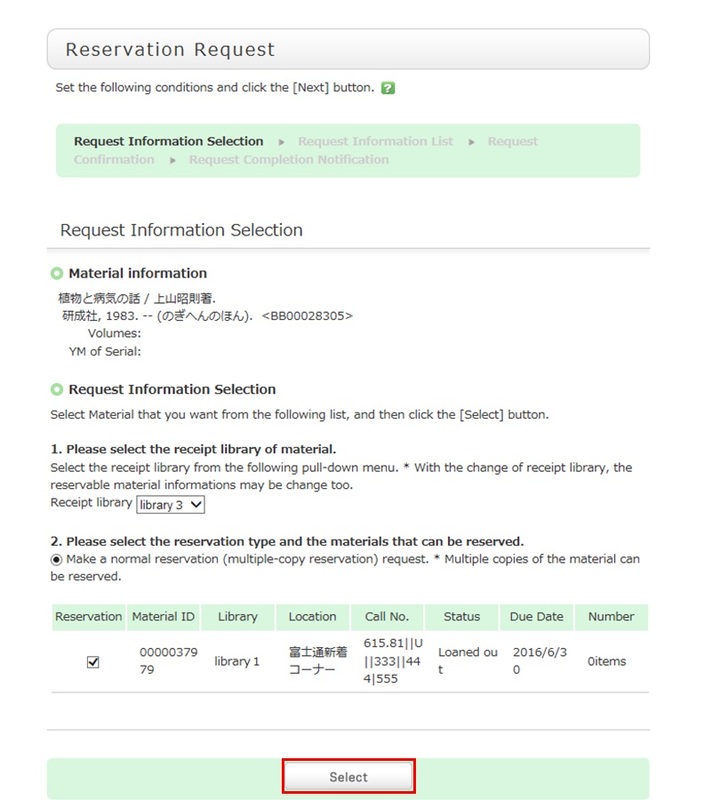 The library uses it to inform you when your reserved materials are available for check-out. To be contacted at a different e-mail address, fill in the "Change E-mail" field. Telephone number (Required input field): Type in your contact telephone number. The library uses it to inform you when your reserved materials are available for check-out. To be contacted only by e-mail and not by telephone, type in words to this effect in the "Remarks" field of "Notes." 4. 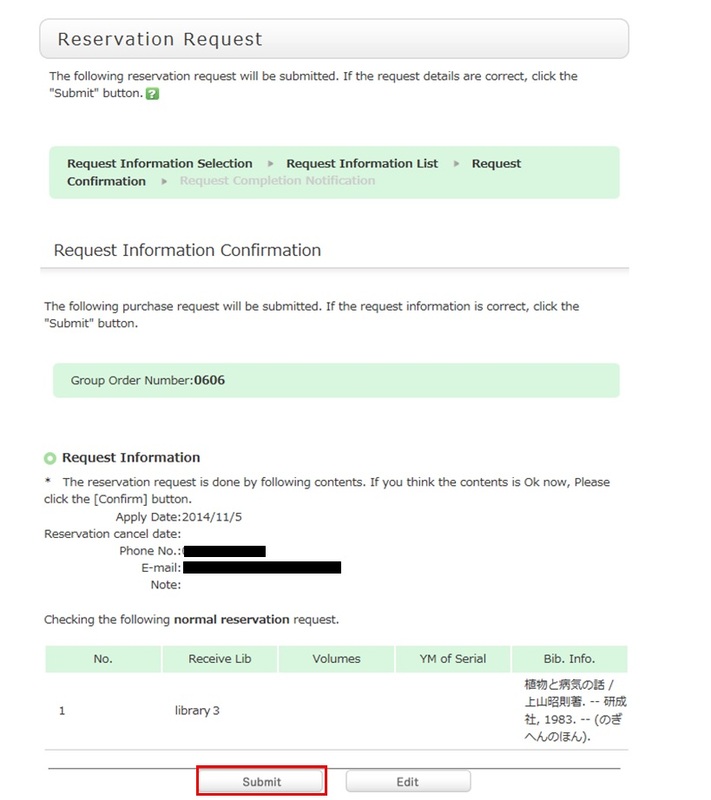 Confirm your reservation request details on the request confirmation screen, and then click the [Confirm] button. 5. The reservation is complete when the request completion notification screen appears. * Reserved materials are on hold for a period of time. 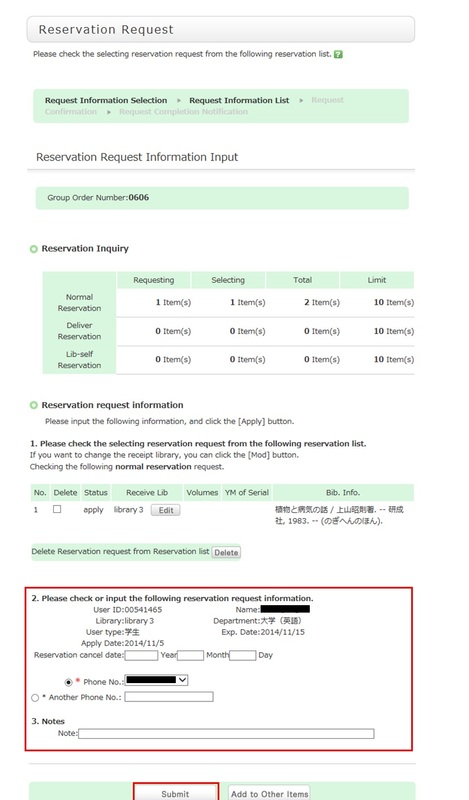 If you do not borrow the materials within this period, the reservation is canceled. So when the library contacts you about the arrival of your reserved materials, visit the library as soon as possible and complete the procedure for borrowing. What should I do if I want to use materials from a different university library? From the [Other Univ.] tab, you can search the books and serials mainly held by Japanese university libraries, etc. Articles cannot be searched. If you want to search articles, perform the search from the [Article Search] tab. A search with an entered keyword will display the search result list screen. 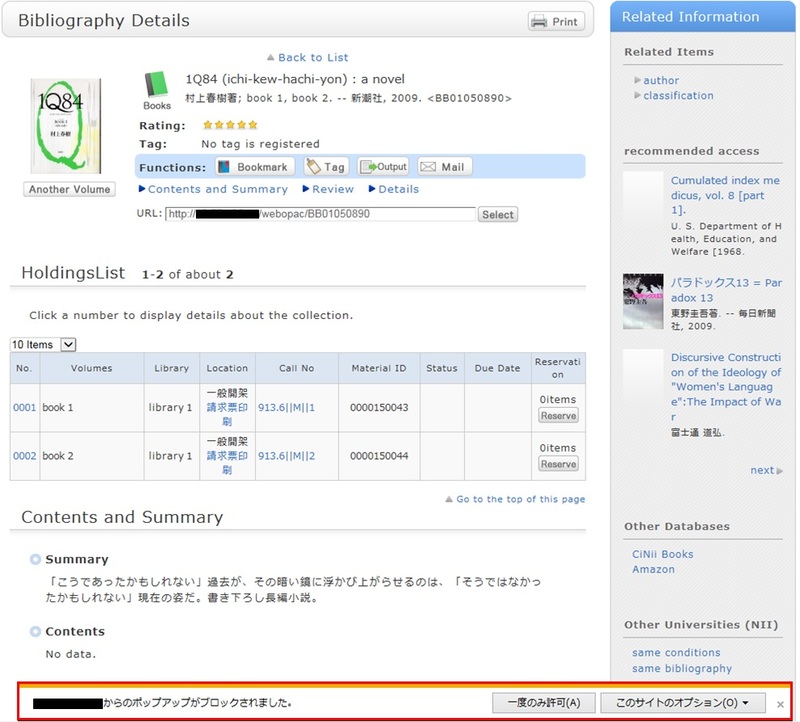 When a material is selected from this screen, the NII bibliography details screen appears. Click one of the following options of the "Get it from another organization" item displayed in the right menu on the screen. 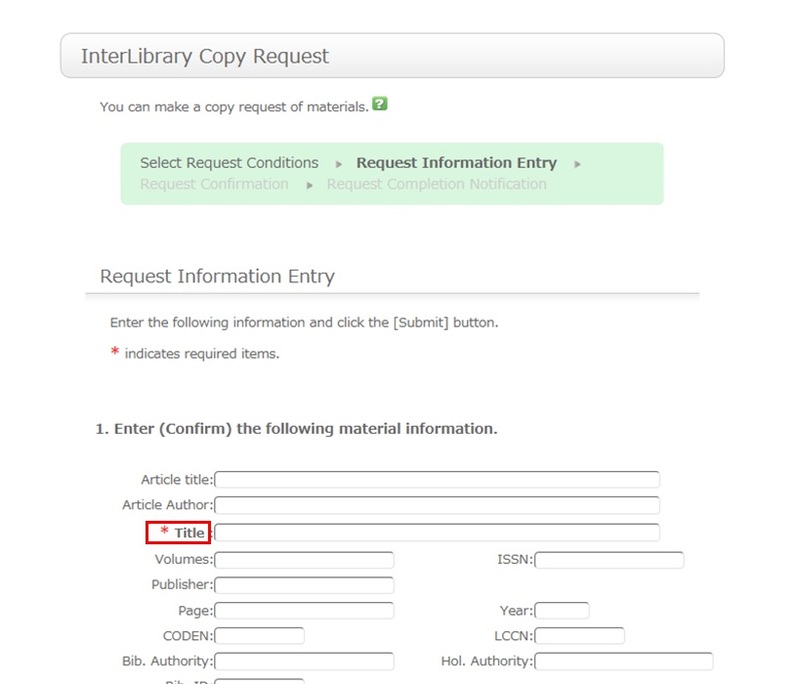 ILL Copy Request is a service for getting copies of parts of articles and books from other university libraries, etc. 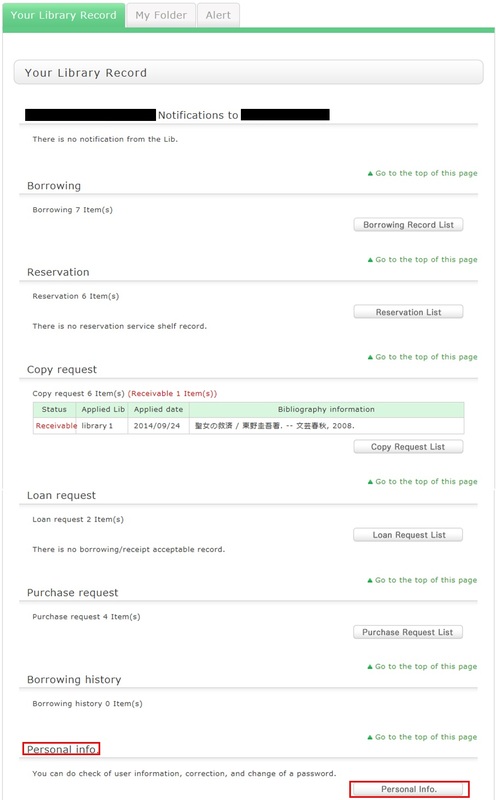 ILL Borrowing Request is a service for getting books from other university libraries, etc. What if I want to use materials from a neighborhood public library? To use books from a neighborhood public library, go directly to that library to use the materials. The borrowing rules follow the rules of that neighborhood library. There is an article that I want to obtain but haven't found it. If you have detailed information on the article, enter the detailed information for the material from ILL Copy Request on the left side of the screen. select the [Other Univ.] tab from the search bar. Select ILL Copy Request from the detailed pages (NII bibliography details screen) of that serial. If you found the article elsewhere, such as in another system, see the respective system help to make an ILL copy request. How do I fill in the copy request screen? 1. First, enter information on the materials you are looking for. To be certain about obtaining those materials, enter as much detailed information as you can. In particular, if you found them in a database or other such system, write the name of this system in the bibliography authority. * The screen is for requesting a serial. Note that a different screen is used for books. 2. Next, enter your own information in the client information fields. Note that if your contact information has an error, the materials may not be promptly handed to you. So be sure to enter the correct contact information for getting in touch with you. 3. 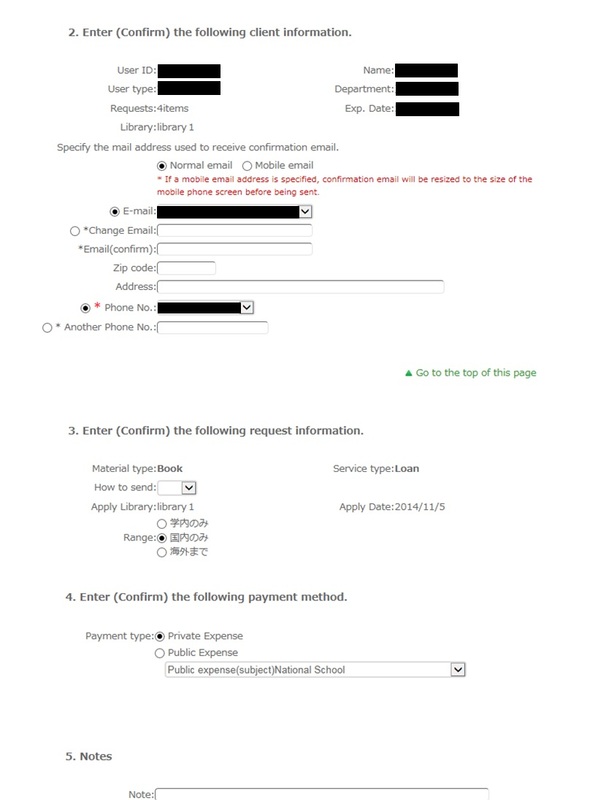 Next, enter information about your request, information about the payment method, and remarks. 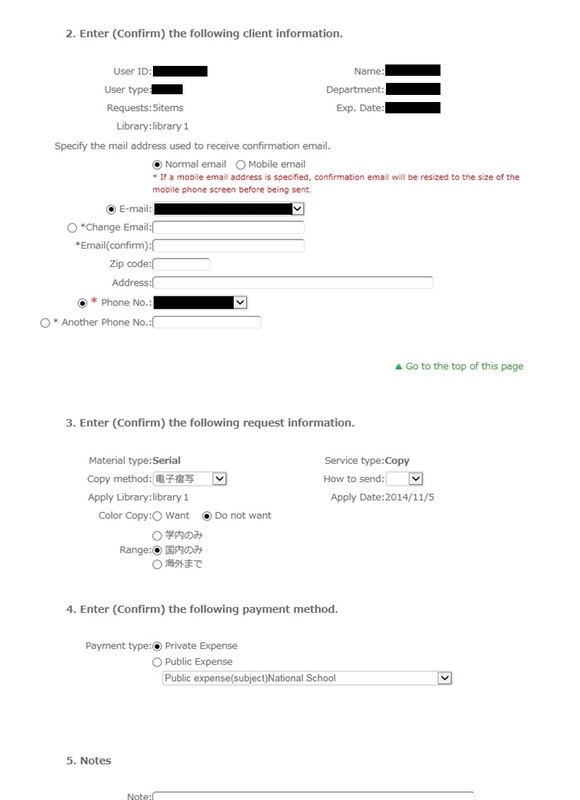 For the information about your request, write the following information: copying method, delivery method, and receiving library. Note that copy requests are handled for a fee, so also select the range of your request. In particular, note that copy requests from outside Japan may cost more and may take more time than those from inside Japan. Check your request carefully. For the payment method, you can select private expense or public expense. To apply for payment at public expense, you must have a public expense budget. You may have information other than the above to report separately. An example is a separate request on the printing method or receiving the copy. Enter such information in the Remarks field. Once you have entered the above details, click the [Submit] button, and confirm the details on the confirmation screen. When there are no problems, click the [OK] button to complete the procedure. How do I make an ILL borrowing request? 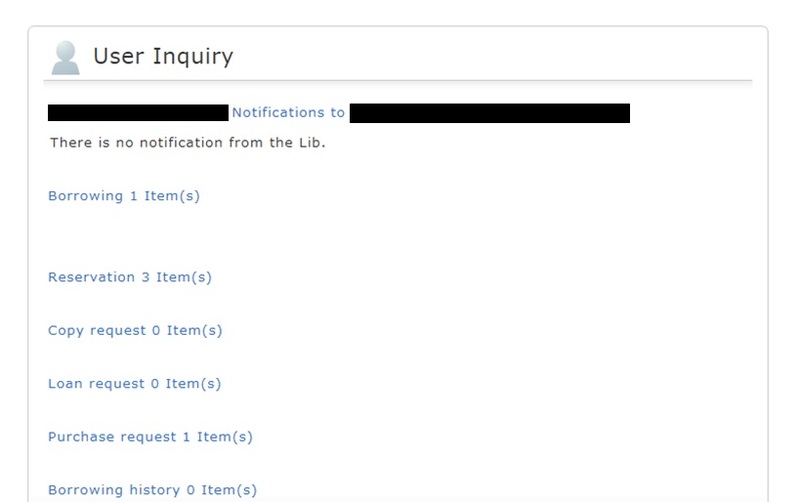 * First, be sure to search long enough to be certain that the library does not have the materials you are looking for, and then make your request. * Bold characters indicate required fields. Note that if your contact information has an error, the materials cannot be promptly handed to you. 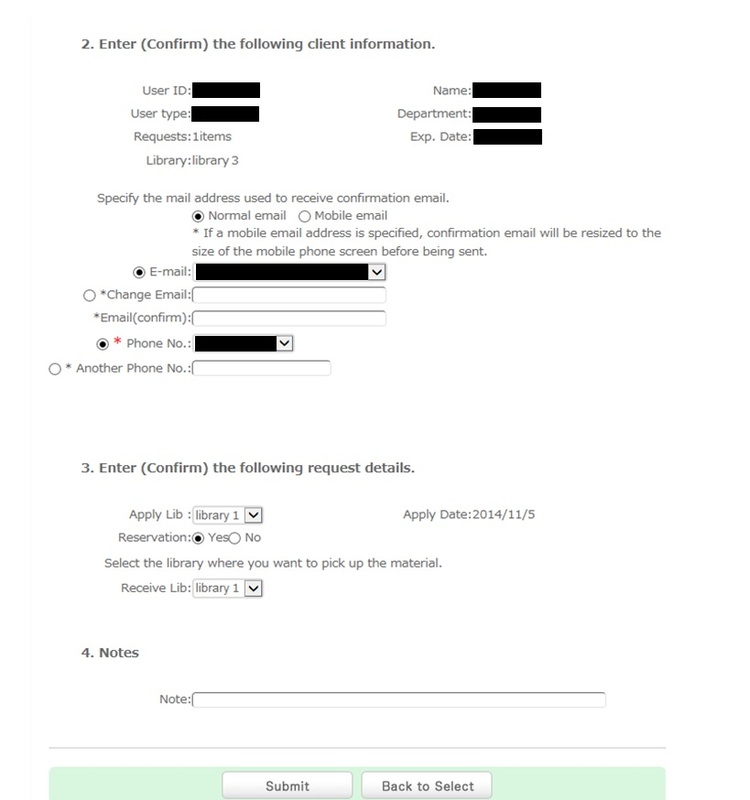 Write information regarding your request, such as the delivery method and information on the receiving library. Also, select the range of the request. You may have information other than the above to report separately. Examples include "Cancel the request if the use is limited to the premises" and "Cancel the request if copying is not permitted." Enter such information in the Remarks field. How do I cancel a submitted copy request (ILL copy request)? User Inquiry allows you to cancel the request. 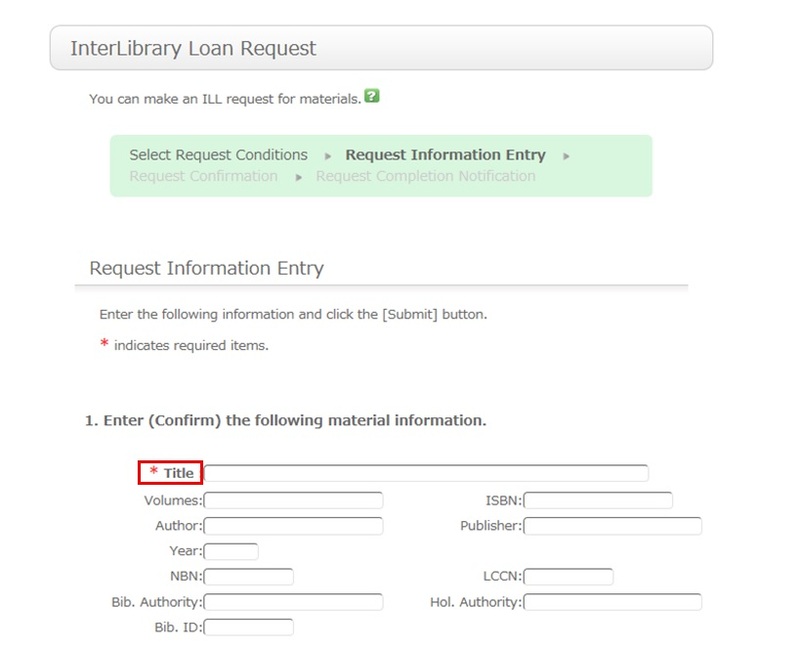 You can confirm your loaned out materials and various requested materials on the user inquiry screen. Select "Go to Copy Request List" in the information relating to copy requests, among those requests. As a result, you can check a list of the copy requests that are current requests. If you want cancel the request for a material in this list, place a check mark beside the material and click the [Cancel Request] button. How do I cancel a submitted borrowing request (ILL borrowing request)? 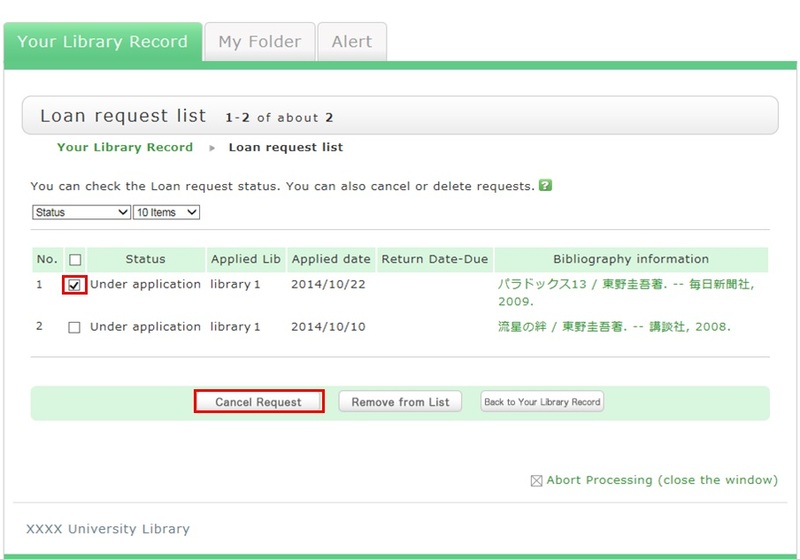 Select "Go to ILL Request List" in the information relating to borrowing requests, among those requests. As a result, you can check a list of the borrowing requests that are current requests. What kind of personal services are available? To use the personal services offered, you need to have an account with the library. The personal services offered are broadly divided into the following three functions. Use this function to browse your current borrowing status, apply for an extension of the borrowing period, and change data such as personal information. This function is used to save search conditions, save search results, and browse the tag/review history. This function notifies you of the arrival of new books and serials at the library. I can't log in to OPAC. To use OPAC, you need to follow the procedures. If you have forgotten your ID or password, go to the library counter. What can I do from Your Library Record in OPAC? Renewal and export to the book management tool are both possible from the list. To do so, enter a check mark in each appropriate check box. Click a bookmark title to check the status in detail. Canceling a reservation, deleting one from the list, and export to the book management tool are all possible from the list. To do so, enter a check mark in each appropriate check box. Click a bookmark title to check the reservation status in detail. Canceling a copy request, deleting one from the list, and export to the book management tool are all possible from the list. To do so, enter a check mark in each appropriate check box. Canceling a borrowing request, deleting one from the list, and export to the book management tool are all possible from the list. To do so, enter a check mark in each appropriate check box. Click a bookmark title to check the request status in detail. Deleting a request from the list and export to the book management tool are both possible from the list. To do so, enter a check mark in each appropriate check box. Click a bookmark title to check the purchase status in detail. Deleting an item from the list and export to the book management tool are both possible from the list. To do so, enter a check mark in each appropriate check box. Click a bookmark title to check the borrowing history in detail. You can check and update your personal information. You can use the updated information to apply for a reservation, etc. How do I change personal information in OPAC? You can check and change the information from [Your Library Record] -> [Personal Info.] in OPAC. Click "Notifications to Mr./Ms. _____" in "User Inquiry." Click [Personal info.] in "Your Library Record." Click [Change Personal Info.] on the next screen, and make your changes. What kind of functions does My Folder have? The following functions are collectively called My Folder functions. This function creates a list of materials on the Web. You can register the books you have already read or plan to read. The list can also be used as a list for outputting data to EndNote and RefWorks. This function saves search conditions. So you can perform your next and subsequent searches using the same search conditions. This function is used to browse the history of your own written reviews. This function is used to browse the history of your own registered tags. Can I have a list of materials kept for me to check at a later date? The materials you searched for in Bib Search or checked in detail are registered as your browsing history. They remain there until you close your browser (or stop using it for a while). * The screenshot is the screen displayed after "Browsing History" is clicked. To confirm content at a later date, register it in a bookmark. Register it in the bookmark from the search result list or the bibliography details screen. To register a material on the list screen, enter a check mark in the check box of the material, and click the [Bookmark] button. You can check the registered contents from the bookmarks. I want to save search conditions to use in a search at a later date. Can this be done? The search conditions you enter in OPAC Bib Search are registered as a search history until you close your browser (or stop using it for a while). You can check the search history by clicking the [Search History] button at the top of the screen. * The screenshot is the screen displayed when "Search History" is clicked. To save search conditions until a later date by registering them from the search history browsing screen, enter a check mark in the check box of each search condition, and click the [Add to Favorites] button. You can check the registered contents from My Search in OPAC. I want to be notified when the latest issue of the serial _____ arrives. Is this possible? 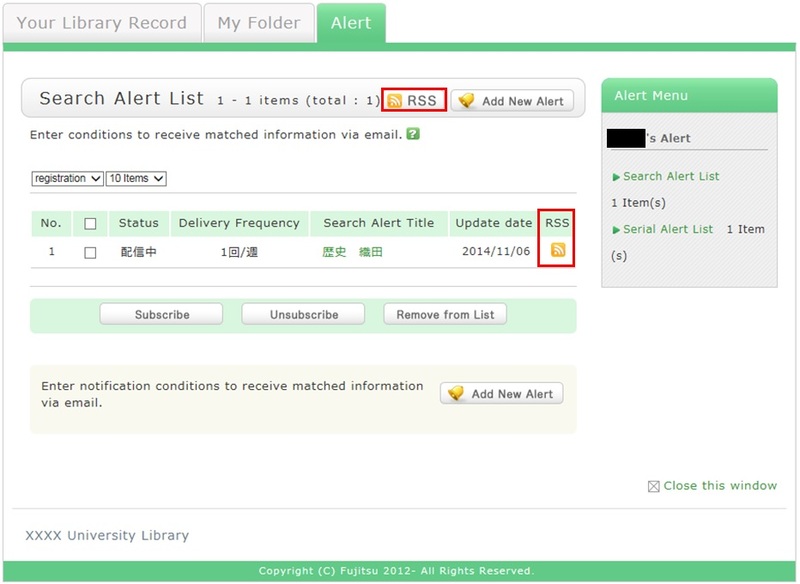 The library has an alert service for notifying users by e-mail or RSS of the arrival of the latest issue of a serial. 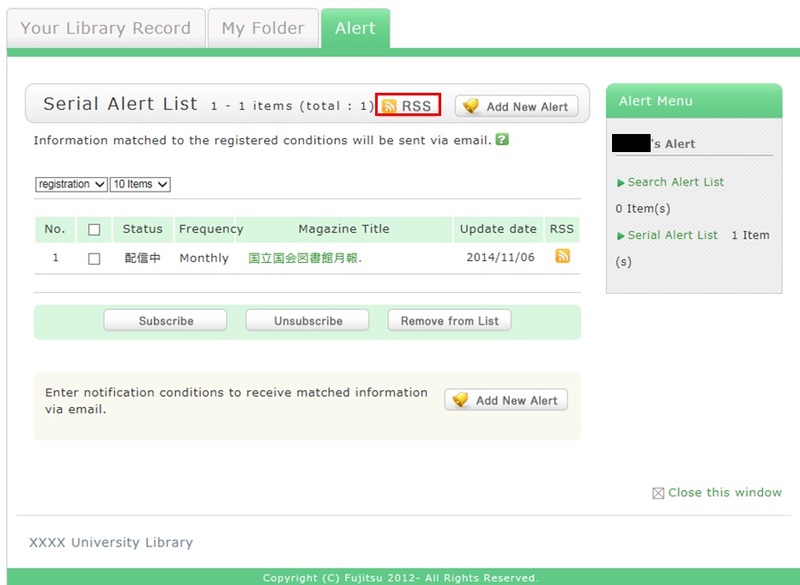 Apply for the alert service from the bibliography details screen. This service covers serials being received on an ongoing basis. Once you complete your application, the registered conditions appear on the alert list screen. You can stop the sending of notifications and change the sending frequency on the alert list screen. Also, you can register an RSS reader from the [RSS] button. Once you have registered the RSS reader, you can check for any new arrivals of the relevant materials, even without checking OPAC. I want to be notified of any books related to _____ received by the library. Is this possible? OPAC employs a service called Alert. The function of this service is to memorize search conditions and send notification by e-mail, RSS, etc. when the library receives any matching material. After a search with OPAC Bib Search, you can register the search conditions by clicking "Add Search Alert." You can also register search conditions from Alert in OPAC. The process of registration displays the Alert list screen. From there, you can check the list being sent and change the sending frequency. You can register an RSS reader from the [RSS] button. I want to write a review about the material, but I couldn't find it. Is May I write one? The reviews you write now will serve as references in the future for junior colleagues reading the same materials. By all means, post your reviews. 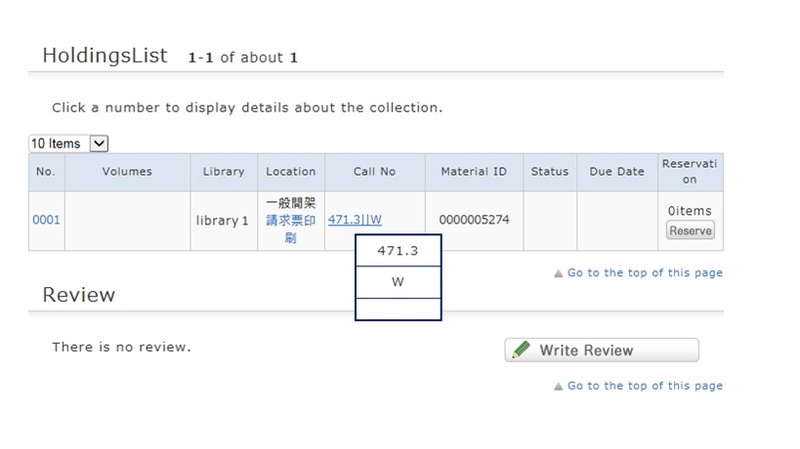 You can post a review by selecting "Write Review"
from the bibliography details screen. before it appears on the screen in order to determine its appropriateness. Therefore, it may take some time for your review to appear on the screen. The library may keep a review from appearing on the screen. Your understanding is appreciated in such cases. Note that your personal information is kept confidential. Information on the people posting reviews appears as nicknames and the like. How do I register a review? 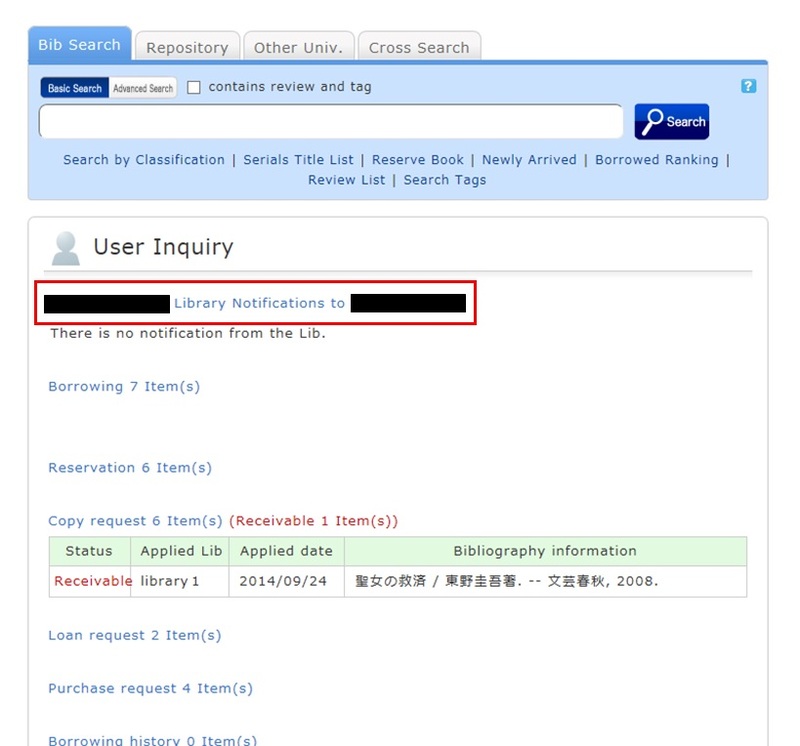 To register a review, click [Write Review] on the bibliography details screen. Confirm the bibliography of your written review, and decide the number of ★(1 to 5) for an evaluation. Then, enter the review title and text, and click [Submit]. You cannot use HTML tags and machine-dependent characters. Confirm what you are registering. When there is no problem, click the [Submit] button. To start over with the entry, click [Edit]. When your review is published, the contributor's nickname, date, section affiliation, library affiliation, and user type are posted in addition to the review title and text. If you want to set or change your nickname, select [OPAC] -> [Your Library Record] -> [Personal Info.]. Confirm the name displayed in the "Handle" column. To correct the name, click [Personal Info. ], and enter your new handle name. You can enter comments about the review, add reference information, and report inappropriate reviews. Was this review helpful? Yes? No? How do I check my written reviews? You can check a review from [OPAC] -> [My Folder] -> [Review History]. Method 1) In the bibliography search result list screen, enter a check mark in the check box of the bibliography whose tag you want to register, and click . 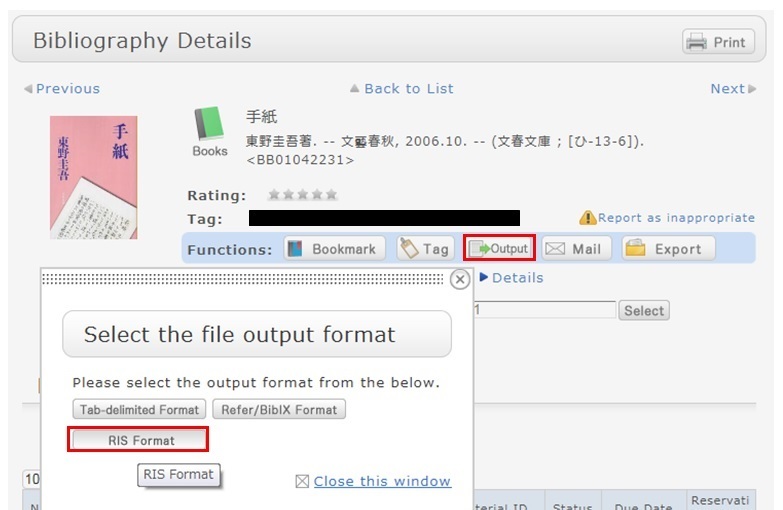 Method 2) In the bibliography details screen, click . However, tags such as those used in a list of the specified books in a syllabus (e.g., all university, 2012 first term) cannot be registered. 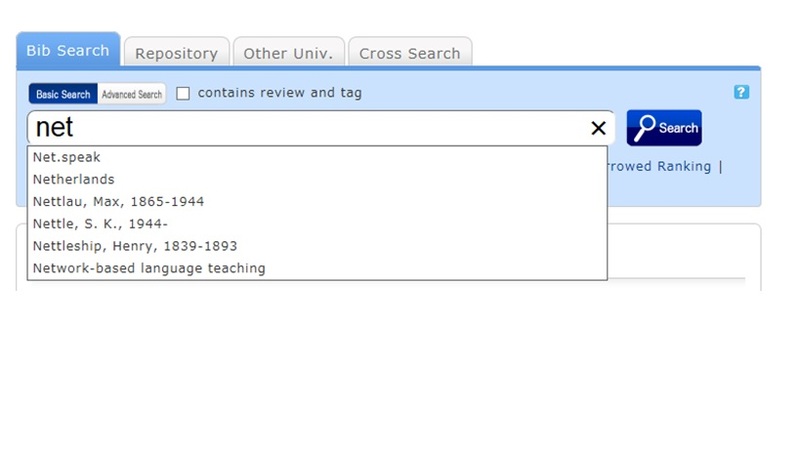 By attaching the same tags to multiple bibliographies, you can batch search them. You can check the tag history from [OPAC] -> [My Folder] -> [Tag History], which is on the right menu. What if a tag is inappropriate? If you think that a tag is inappropriate or does not match the material, please contact us. 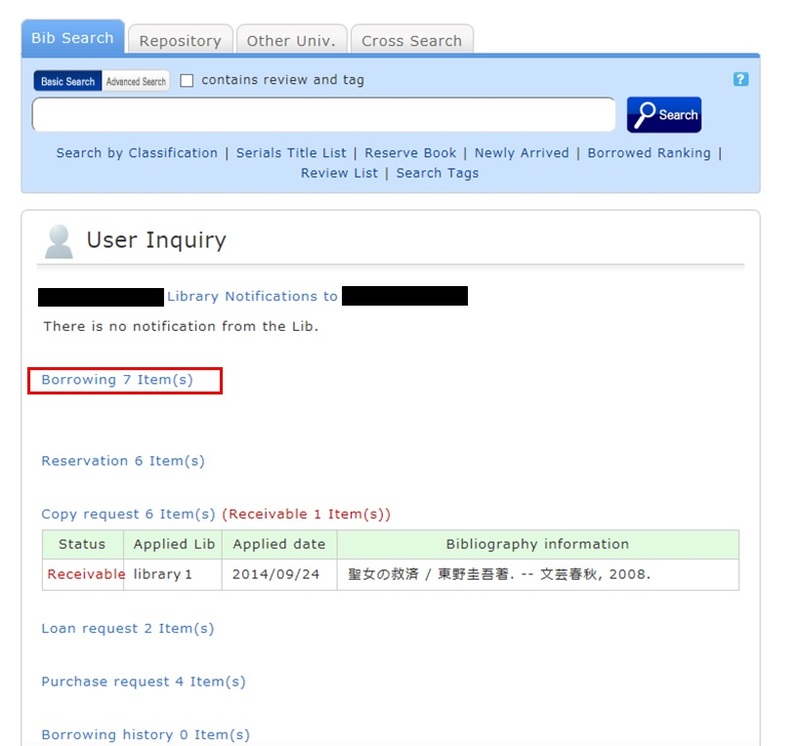 Click [Report as inappropriate] behind "Register tag" on the bibliography details screen to register your report. How do I check the tags that I attached? I have books used in lectures and laboratories. I want to share them with friends. Is there a good way to do this? You can group multiple materials by adding tags to them. For example, suppose you add a tag such as the following: "This was helpful in _____ lecture." or "A must read for _____ laboratory." Then, anyone can bring up the same list of materials when searching tags. You can register tags from both the list screen and details screen. ★I have a book I want to sell. ★I want to express a question, opinion, or request to the library. What kind of service is OPAC? OPAC is the generic term of a search system for library book collections. OPAC is the abbreviation for Online Public Access Catalog. ★Can I use materials whose holdings location for the OPAC search results is [Faculty office]? check the Kanji and spelling of keywords to see whether they are correct. Are searching by "Article title" or "Article author"? Try searching by serial title. When you want to search by "Article title" or "Article author," try searching from the [Article Search] tab. In such cases, you may also be able to read the text of electronic journals from a personal computer. If you still do not find the materials you are looking for, try searching from the [Other Univ.] tab or [Cross Search] tab. If you can confirm that the library of another institution possesses the materials you are looking for, you may be able to go directly to that library to use the materials there or get them from the library. You can search for and obtain materials from the search screen by following the procedure below. 1. 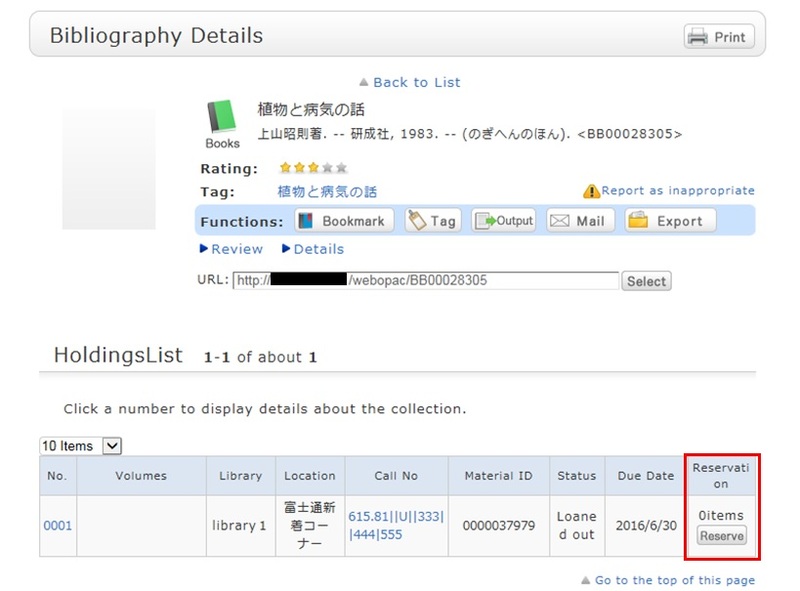 Search the holdings of other university libraries and the National Diet Library, and apply to get the book or a copy (ILL copy request and ILL borrowing request) from the relevant library. → Perform the search from the [Other Univ.] tab or the [Cross Search] tab. 2. Search the holdings of your neighborhood public library and university libraries, and visit the relevant library directly. 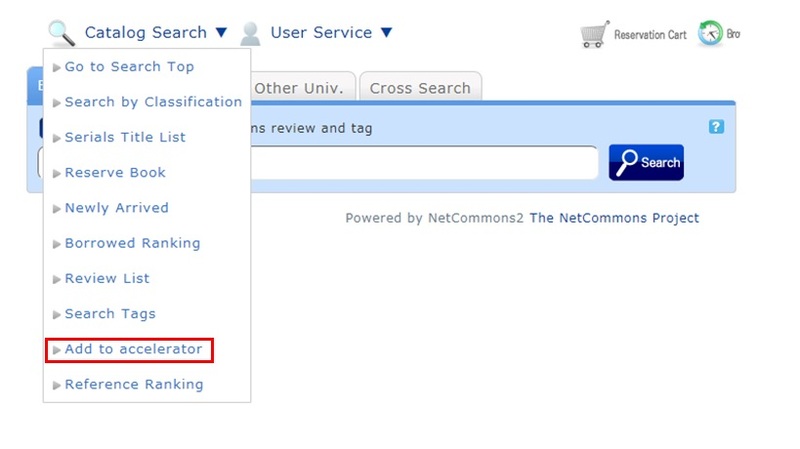 → Perform the search from the [Cross Search] tab by selecting a neighborhood public library, university library, etc. 3. Perform a search from a bookstore, etc., and consider purchasing the materials there. 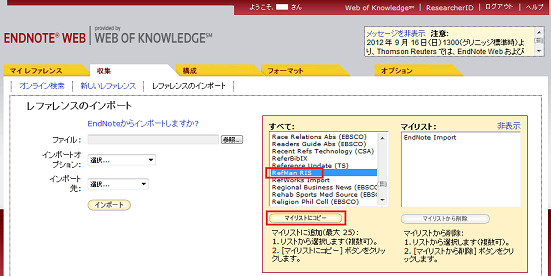 → Select a bookstore and perform the search from the [Cross Search] tab. 4. 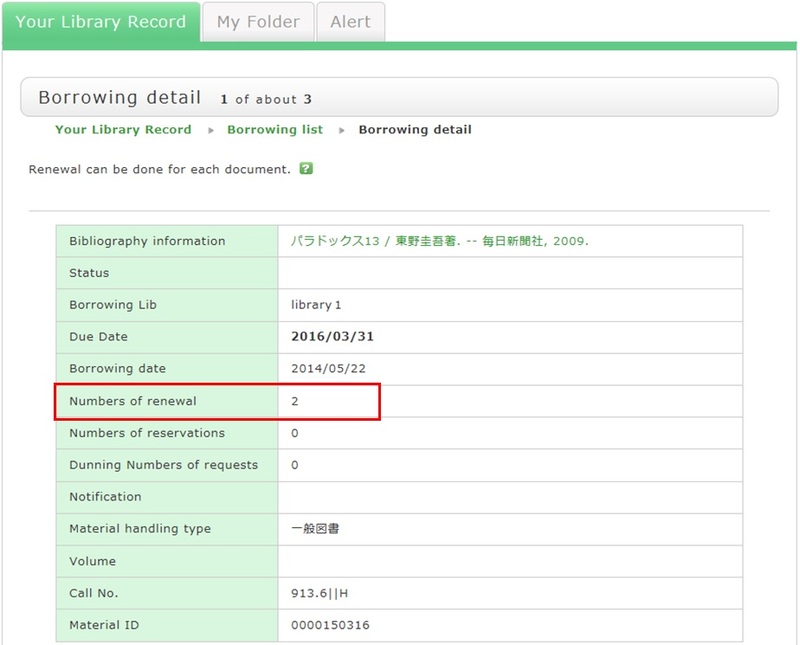 Search the holdings of libraries outside Japan, and get the materials from the relevant library. * Getting a book or inter-library loan from a library or other such other organization outside Japan takes a significantly long time. Due to a variety of reasons, it may also be impossible to get materials from libraries outside Japan. For details, consult the library staff. What do I do when I want to extend the borrowing period of a loaned out book? From OPAC, you can check and renew the materials you have borrowed from the university library. 1. First, log in to OPAC. 2. "User Inquiry" appears after login. Click "Borrowing" there. 3. "Borrowing list" appears. Place a check mark beside each material you want to renew, and click [Renew]. 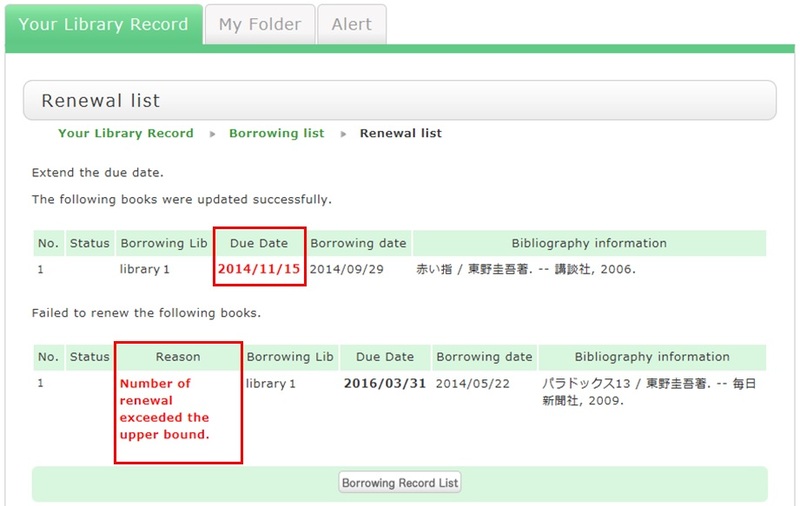 In "Borrowing list," you can check the borrowing status: where (borrowing library), what (bibliography information), and when (Due Date). 4. Click [OK] in the pop-up. 5. The update is completed when the return date is extended. If the update cannot be completed, the screen displays this fact and the reason for it. 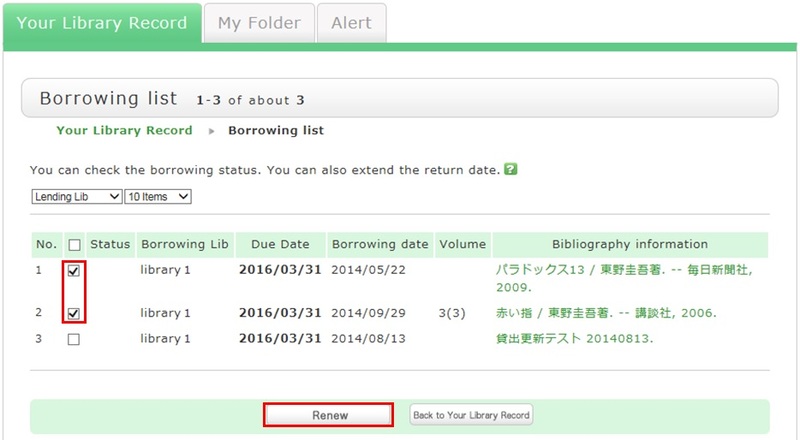 From "Borrowing list", you can check the number of renewals by clicking "Bibliography information" for loaned out materials. Note the following points concerning renewal. Renewed return dates are calculated based on the special online rules of each holding library. An online renewal is updated on the day that the update process is executed. Note that the borrowing period is not an added period from the due date. 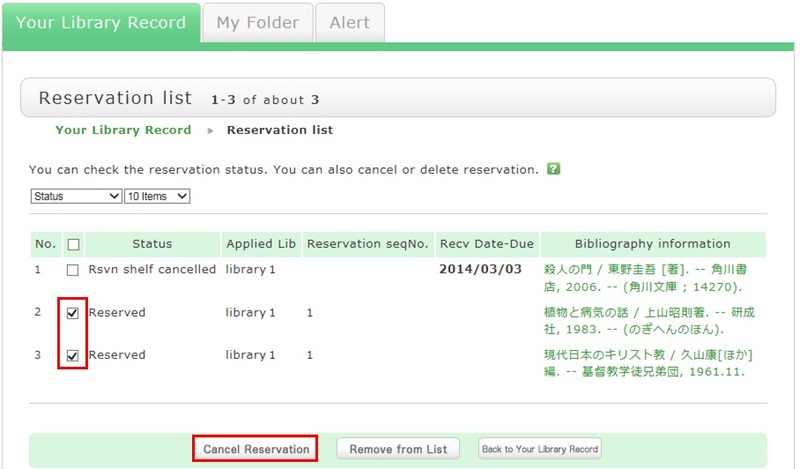 When you want to cancel a reserved material, you can delete the reservation from OPAC. 1. Log in to OPAC. 2. Click "Reservation" from User Inquiry on the OPAC top page. 3. The reservation list screen appears. 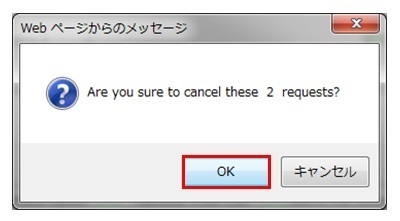 Place a check mark beside the material whose reservation you want to cancel, and click [Cancel Reservation]. 5. "Canceled" appears under Status upon the completion of the reservation cancellation. ★What happens when materials become overdue or have borrowing restrictions? If you do not return library materials even after their due dates have passed, borrowing is restricted on your account until you return the materials whose due dates have passed. Meanwhile, with materials overdue or penalties incurred, the account cannot reserve or renew any of the library materials. Be sure to return all materials within their borrowing period. Cancellation of a borrowing restriction takes effect on OPAC at about 6:00 a.m. on the cancellation date. If you are a user whose borrowing is restricted but you want to renew or reserve different materials currently checked out from the same library/room, do so after 6:00 a.m. on the borrowing restriction cancellation date. Libraries/rooms have book drops. Any materials returned after hours to the book drop of a library are basically considered returned on the previous business day with the return processed on the next business day. Library/room use privileges may be suspended for long overdue accounts. Overdue materials and materials with penalties incurred at a library/room can be borrowed from another library/room. They can also be reserved and renewed from OPAC. Even if your account still had overdue materials and a borrowing restriction, you could apply from OPAC to copy a book (get a copy from another library) and borrow a book (back-order the actual book). You could also make a library purchase request (* Being prepared). What is [Reserve Book] in the catalog search menu under the keyword input box on the [Bib Search] tab? 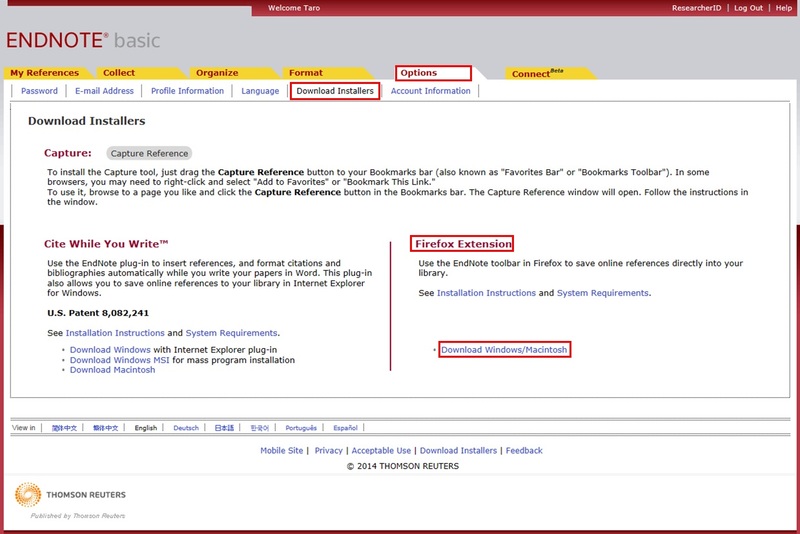 Reserve Book enables you to view a list of syllabuses, instructor-specified textbooks, reference books, etc. You can change the display target from the pull-down menu. What are the reviews displayed on the review list screen? On the Review List screen, you can check a list of bibliographies that have reviews. By clicking the RSS icon , you can check newly registered reviews in the RSS reader you normally use. You can register a review from the bibliography details screen. What are the tags displayed on the tag search screen? You can group multiple materials by adding a tag to the materials. You can search for a tag on the tag search screen to display a list of materials that have this tag. Suppose you add a tag such as the following: "_____ seminar reference book" or "A must read for _____ class." Then, after a tag search, anyone can bring up the same list of materials. For example, try clicking a tag in "New tags," "Recent tags," or "Popular tags." Then, materials that have these tags are displayed. 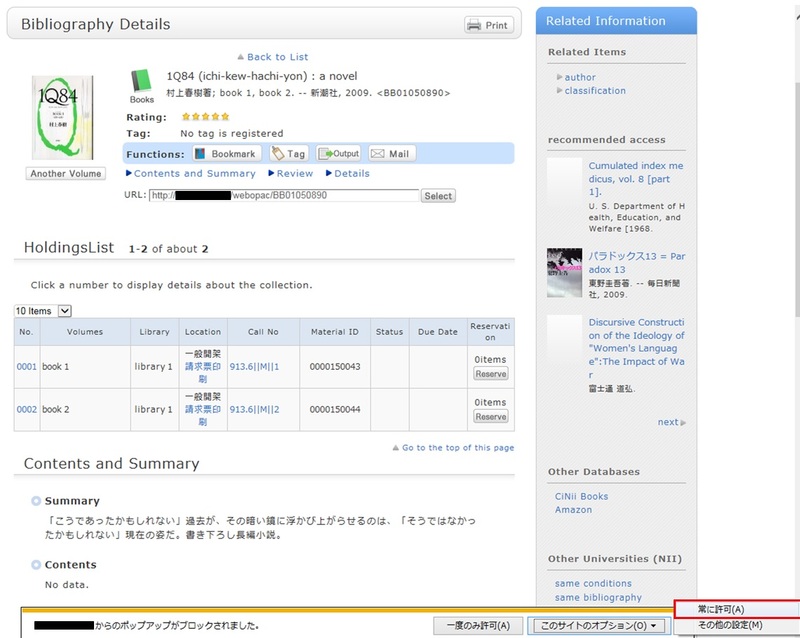 You can register tags on the search result list screen and the bibliography details screen. What should I do if I want to search reviews and tags? You can search the title or full text of reviews and tags in any of the following five ways. See " New Tags" and " New Reviews" on the top page. Select "Review List" or "Search Tags" under the search bar on the [Bib Search] tab. In [Basic Search] on the [Bib Search] tab, enter a check mark for "Contains review and tag." In [Advanced Search] on the [Bib Search] tab, select "Review" or "Tag" from the pull-down menu and search the materials. Select "Review List" or "Search Tags" from the catalog search menu. How do I return to the original search result list after a refined search from the left menu on the search result list display screen? The following screen appears when you have entered a keyword and performed a refined search from the left menu on the Bib Search result list screen. The following is the example narrowing Holding Libraries "library１". Cancel the search conditions for this holding library. Then, to return to the original search result list, click the red x button in the blank area under "Selecting conditions." Even if you have performed multiple refined searches, you can cancel any narrow-down search condition by using the above method, regardless of the order of the searches. Suppose that you perform a refined search of a holding library, select a bibliography on the bibliography search result list screen, and then move to the bibliography details screen. Even after that, you can still cancel the refined search of the holding library and perform a refined search of another library. How do I import book information from OPAC to EndNote Web? 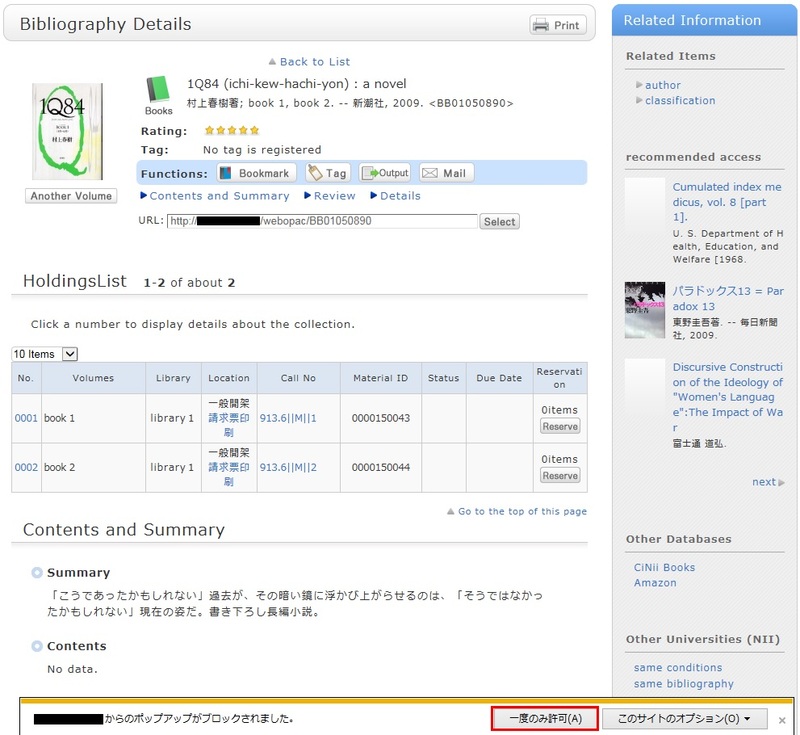 You can import book information from OPAC to EndNote Web. 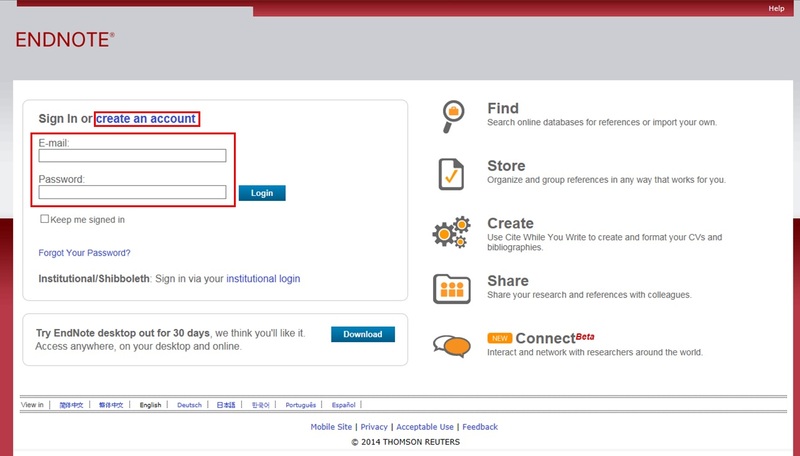 Log in to EndNote Web. * Users who do not have an account with EndNote are requested to register as users from "Account Registration." Click [Options] -> [Download Plugin]. If you are using Internet Explorer or Safari as the browser, select "Download Windows Version" or "Download Macintosh Version" from CWYW (Cite While You Write), according to the operating system used on your computer, to download the plugin. 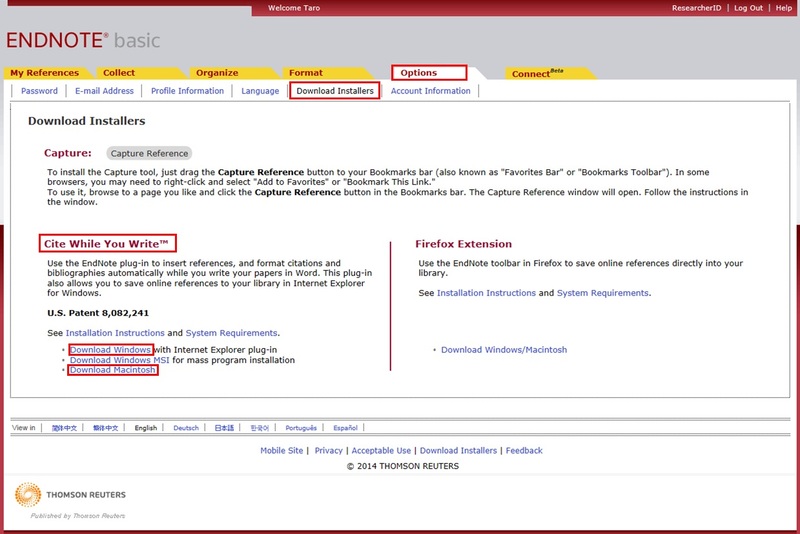 Click "Download Windows/Macintosh Version" in Firefox Extensions to download the plugin. When a message prompting you to restart Firefox appears, restart Firefox. From the Firefox menu, click [Tools] -> [Add-ons] -> [Extensions]. Then, click [Options] of EndNote Web. Confirm that the pop-up check box is checked. This completes the plugin download procedure. Click "Book Management" on the bibliography search result list screen or bibliography details screen. 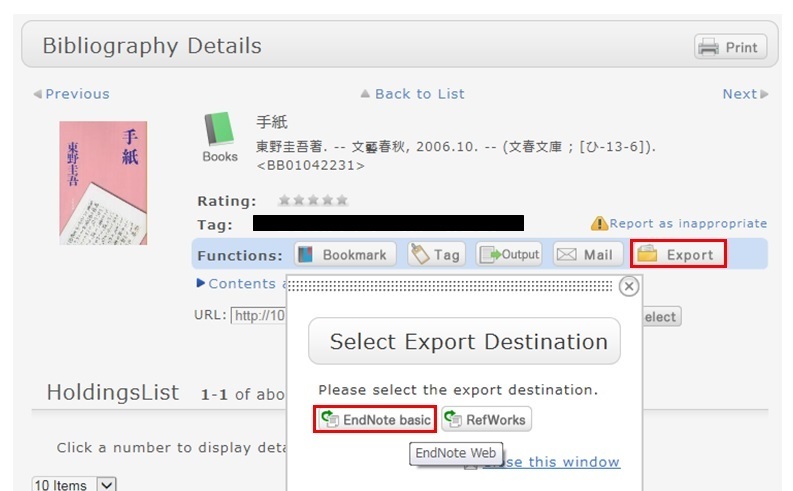 When the "Select Export Destination" pop-up appears, select "EndNote Web." Click "Output" on the bibliography search result list screen or bibliography details screen. When the "Select the file output format" pop-up appears, select "RIS format." The file is downloaded. Save the file at an appropriate location on your computer. Click [Collect] -> [Reference Point]. Click the [Browse] button in "File," and select the newly saved file. Select "RefMan RIS" for "Import Options." Specify the import destination folder in "Import Destination," and click the [Import] button. The selected bibliography is imported to EndNote Web. * If "RefMan RIS" does not appear in "Import Options," click "Select Favorites," select "RefMan RIS," and click [Copy to My List] to add the file to My List. How do I import book information from OPAC to RefWorks? You can import book information from OPAC to RefWorks from the following screen. You can import book information directly (direct import) to RefWorks without downloading a plugin. Register as a new user only the first time. The "Select Export Destination" pop-up appears. Select "RefWorks." ★I want to copy library materials. Does the library have any photocopiers inside? How do I search OPAC from the accelerator? 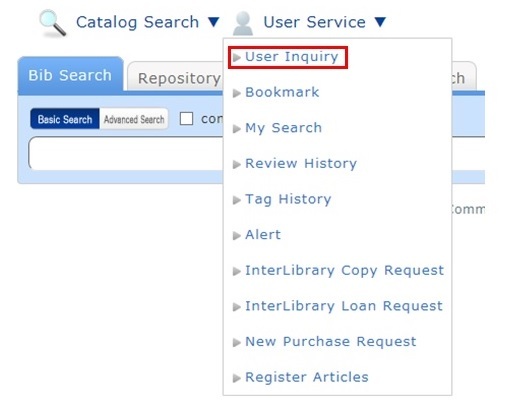 The accelerator allows you to perform an OPAC keyword search with just one click. Simply select text in a webpage, which highlights the text, and click the selected text. * Only Internet Explorer 8 and 9 support this function. Other browsers cannot use the accelerator function. Select "Add to accelerator" from "Catalog Search" on the screen header. If you know that you will be unable to return a book by the return due date because you need it for training purposes or other such reasons, apply for an extended loan when checking out the book. Note that the borrowing period cannot be extended for graduates and people outside the university. To get an extension, visit the library before the return due date arrives, and follow the extension procedure. If you think you've lost a book, first try looking for it again. In general, people who lose, damage, stain, or destroy library books are required to pay the replacement cost. I want to borrow a book but forgot to bring my student card (library card). You cannot borrow books without a student card or library card. This policy prevents anyone impersonating you from borrowing books. Your understanding is appreciated. What if I can't find a book that hasn't been loaned out or I can't find an issue of a serial in the library's collection? Consider the following possibilities. Consult with staff at the counter. - Someone else in the library is using the book or serial. - The book is in the new books area. - The book is so large that it is placed on the bottom shelf. - Library clerks are processing the returned book or serial. - The book or serial is currently being bound. - The previous user did not return the book or serial to its proper location. ★Can I pay for copies with research funds? I've searched but can't find a material. Are you trying to search for a book in an OPAC search? Also, have you entered the words in your search correctly? The search results change if even a single character is different. ★What is the limit on the number of books borrowed? ★How do I return books to the library after hours? Where do I check out and return books? Follow the procedure at the counter to check out and borrow books. ★Is there an OPAC site for mobile phones? The mobileOPAC website (site for mobile phones) has been established at the following URL. ★Can I get printouts from with my personal computer while in the library? If you do not find the serial you are looking for, ask about it at the counter. The library has numerous types of serials. Annals: Periodically issued serials from universities, research institutes, etc. Newspapers: Publications covering domestic news, global new, news in specialized fields, etc. How do I fill in the purchase request screen? 1. First, enter information on the material you want purchased. So be sure to enter the contact information for getting in touch with you. 3. Select the purchase application area and whether or not there is a reservation. Then, enter a note. You may have information other than the above to report separately. Enter such information in the remarks field. When there are no problems, click the [Submit] button to complete the procedure.